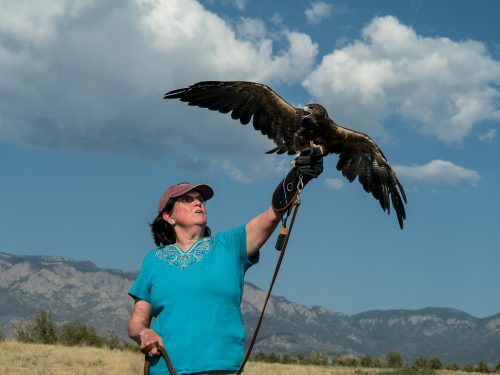 Gail with Idaho, a Swainson’s Hawk and one of the educational ambassadors for Hawks Aloft, Inc. It began innocently enough. 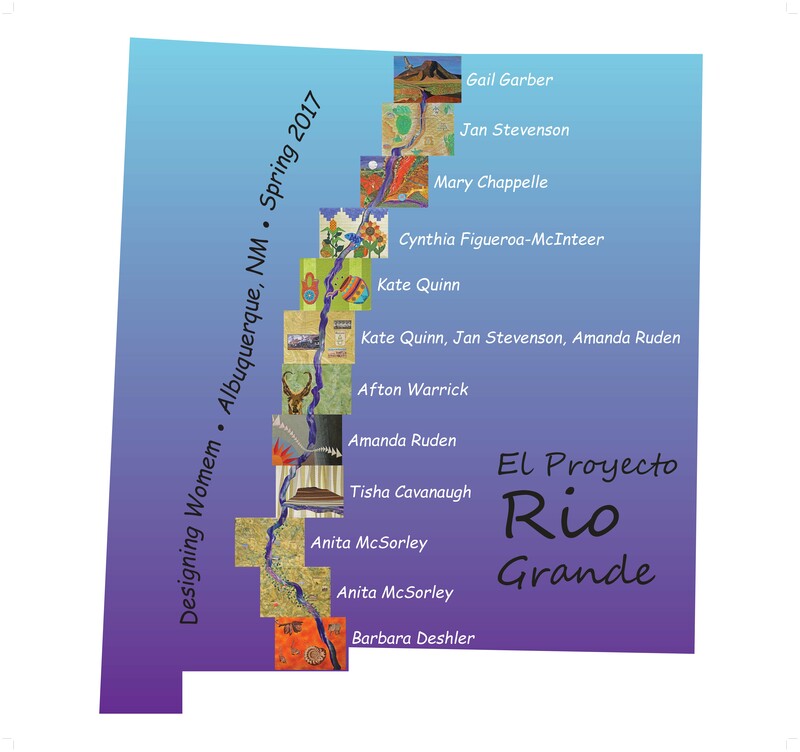 My quilting buddies and I also enjoyed the outdoors, so we formed a Quilter’s Hiking Group to explore the vast trail network in the stunningly beautiful Sandia Mountain Wilderness Area, just east of Albuquerque, New Mexico. Over the course of a couple of years, we hiked one day a week, exploring different trails. We’d bring a snack, and sit in the shade of a tree at lunch time, sharing conversation ranging from quilting to the environment to more eclectic topics. 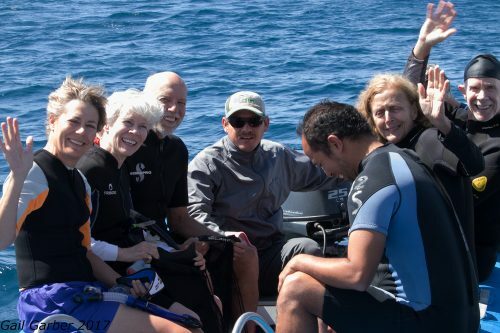 One day, we decided to devote some of our time to benefit a wildlife group that reflected our interest in the outdoors. It had to be locally based, and not be so large as to laugh us out of their office when we offered to make a quilt for them. The first group that we found was a local hawk watching group. 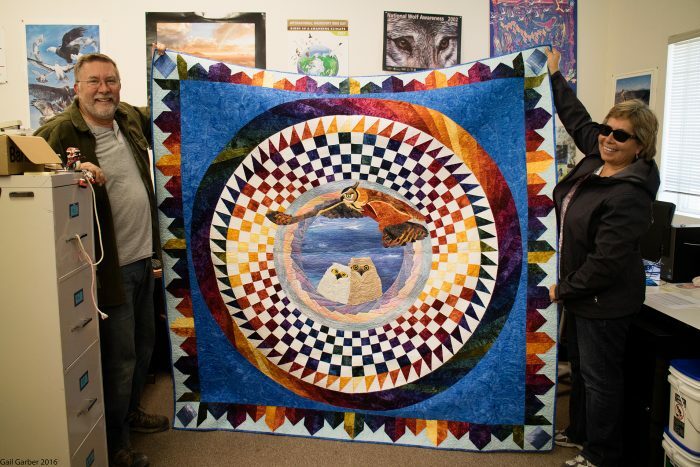 They accepted our offer, and we set about making the quilt, “Save our Eagles”. During that time, I met and fell in love, not with a human, but with a Red-tailed Hawk. She was their educational bird, and until that moment, it had never occurred to me that I might be able to be that close to such a magnificent animal. I became a volunteer, and later a paid staff member. When that organization moved, I, along with others formed the non-profit organization, Hawks Aloft, Inc. in 1994. Today, this organization is the other love of my life! When I am not quilting, you might find me in the back country of New Mexico, working on one of our many studies, or in the classroom, teaching youth and adults about protecting wild areas or even improving your neighborhood for the wild animals that share your community. As a member organization, Hawks Aloft offers a variety of outings to interesting locales near and far. Past trips have included the Galapagos Islands, July 2017, Costa Rica in 2016, as well as more local trips like visiting High Island, Texas to see the spring warbler migration. In February 2018, we are offering an Amazon Riverboat Tour, of the Peruvian Amazon. In January 2019, we invite you to join us for a Flyways Expedition to Guatemala, including a day exploring the incredible textiles for which that country is known. All itineraries are hand-picked itinerary and guaranteed to have small groups. For more information about upcoming tours and future plans, contact Gail. Each year, Hawks Aloft staff and educational ambassadors reach more than 25,000 people, ranging in age from pre-school to seniors. Our education program features a wide variety of age-specific programs, each featuring live educational raptors. To the left, four Hawks Aloft Avian Ambassadors perch together at the Monte Vista, Colorado Cranfest, and annual event that takes place the second weekend in March. 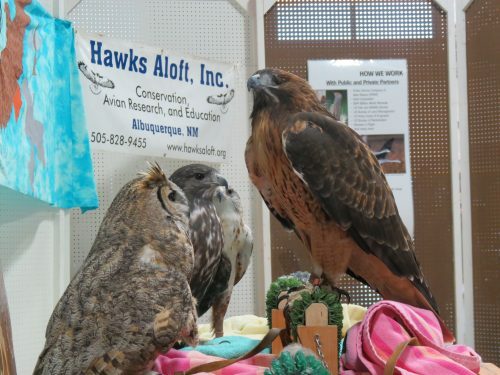 From L – R: Great Horned Owl – Aztec; Harlan’s Red-tailed Hawk – Harlan; Ferruginous Hawk – Ferrug, and Red-tailed Hawk, Aguililla. School programs range from age-specific, single visit programs to the centerpiece of our education program, “Living with the Landscape: Building a Future for Communities and Wildlife”. Classrooms that participate in this program receive multiple classroom visits, two field trips, and students design and implement a local conservation project. Past projects have included releasing endangered species, water quality monitoring, building and installing bat boxes, establishing a school-wide recycling program, planting xeriscape gardens, etc. To learn more about the Hawks Aloft Educational programs contact education@hawksaloft.org. Our research is centered in New Mexico, and ranges from studies of large raptors such as the Golden Eagle and the Ferruginous Hawk, to smaller raptors like the Cooper’s Hawk and Burrowing Owl. About 50% of our studies focus on songbirds, measuring their abundance and number of different species relative to land management. Like the canary in the coal mine, changes in avian populations can provide early warning of declining habitat. Do you have a question about wild birds? Hawk Talk – Ask an Expert is a feature of the Hawks Aloft website in which our staff of avian experts will answer your question about any species of bird, even songbirds! 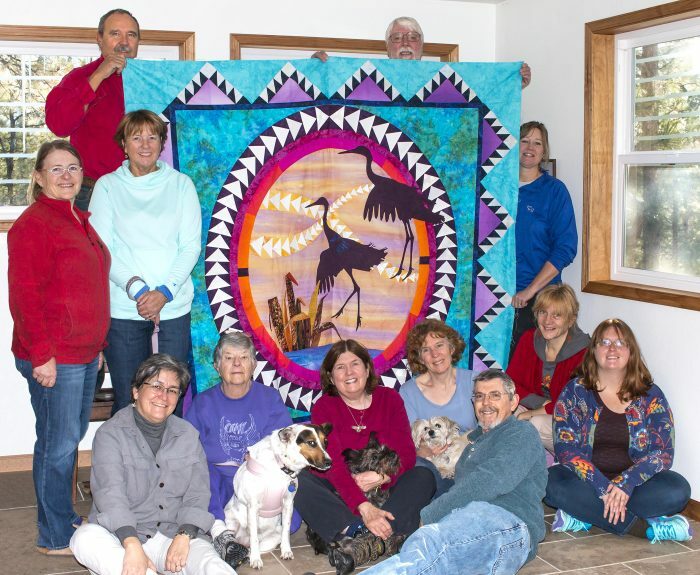 Each year, Hawks Aloft volunteers get together to stitch a raffle quilt. I create the design, create the paper foundations. Then, with the help of a dedicated crew of volunteers, we retreat to my Jemez cabin to stitch our quilt top, usually in one day. In 2017, the quilt was stitched by Mary Chappelle, Ed Chappelle, Julia Davis, Barbara Deshler, Rick Deshler, Steve Elkins, Cynthia Figueroa-McInteer, Chellye Porter, Lizzie Roberts, Sami Sanborn, and Allison Schacht. We are proud of our annual fund-raiser, which has been stitched by a totally balanced gender mix the last few years! After the retreat, we ship the quilt off to master quilter, Kris Vierra, who then works her stitching magic on the top. Hawks Aloft 2017 Raffle Quilt and its makers. The winner of the 2016 Hawks Aloft raffle quilt was Judith Butterman. Her son, Jonathan, purchased several tickets at the Festival of the Cranes at Bosque del Apache National Wildlife Refuge. He put different family members names on the tickets and his mom was the winner. He surprised her with her special quilt gift for Christmas 2016.